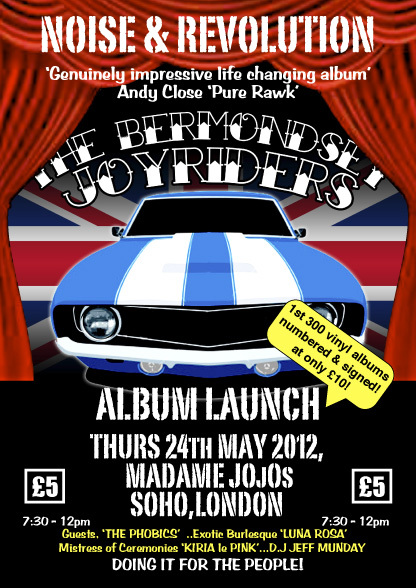 The Bermondsey Joyriders announce the long awaited release of their album ‘NOISE and REVOLUTION’ by playing a special’No holds barred’ performance of the entire album LIVE at Madame jojos nightclub,Soho,London, on Thursday May 24th. + full supporting bill, promises to be possibly,The album launch of the year! + The Bermondsey Joyriders policy of ‘Doing it for the People’ Entrance price has been held to £5! ….two words…Be there!